It is the unique combination of the hull design and the Hamilton jet that enables our boat to move in ways that are impossible with outboards - to remain stationary in fast flowing water, to spin on her axis and brake under power. This enables precision manoeuvring even at slow speeds in strong tides, very useful for film and safety boat charters, essential for making the most of Ramsey's caves but also for fun with jet boat spins (Hamilton turns) or 'doughnuts' as children call them! The boat can do a lot of clever things but it's the ability to make the most of the caves and to have fun that our passengers enjoy most. How Safe Is the Boat? There's no such thing as an unsinkable boat but our RIB is as unsinkable as it's possible to be. Ocean Dynamics made its name by designing craft which are unsinkable in all but the most extreme working conditions. They've survived huge seas, even icebergs; they're very much at home in the challenging waters around Pembrokeshire, where we've been trialling them for over 30 years. These boats are the toughest RIB workboats available and are used in extreme sea environments. They're also fantastic fun! Most RIB hulls are made from GRP (glass reinforced plastic). Our 9 metre hull is made of heavy gauge marine aluminium, the toughest material available; it is divided into separate compartments for further safety (in tests when one part of the hull has been flooded with water the boat still floats). The hull is further protected by collision bulkheads. It is designed for strength, speed and manoeuvrability, its shallow dreadrise angle enabling optimal planing and minimum draft. This allows us to operate safely in very shallow water, for example picking up passengers from beaches, including wheelchair users (subject to sea conditions). The tubes are made of heavy duty Hypalon and divided into 7 compartments, each separated by an industrial strength baffle to ensure maximum strength. Unlike many RIBs the tubes play no part in keeping the boat afloat in normal working conditions, although they offer massive additional buoyancy and shock absorption in rough seas. They are also extremely comfortable to sit on. The boat conforms both to the Marine Coastguard Agency Passenger Boat Code and to the more stringent Workboat Code, with annual external inspections by a marine surveyor approved by the Marine Coastguard Agency. Ocean Dynamics doesn't mass produce RIBs. Each boat is designed individually to meet the challenges of the environment it will face. Ocean Dynamics tested its early RIBs around Ramsey Island, thrilling passengers for some 25 years before selling its tourist operation, Thousand Islands Expeditions, in 2003 to focus on boat building. 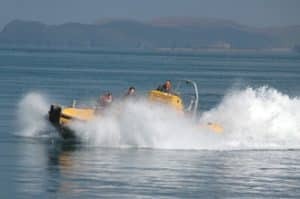 The jet boats were sold abroad but one workboat remained in Pembrokeshire, the one we turned into Shearwater. See The Making of Shearwater photo album. The boat is equipped with a Hamilton 274 jet drive. Jet boats were originally conceived by Bill Hamilton in New Zealand and have been proven to have a sympathetic acoustic signature which decreases wildlife disturbance. Jets have extremely good control and manoeuvrability. Unlike conventional outboard-driven boats, jets are powered by internal impellers. Water is drawn in under the boat and driven out under immense pressure through a nozzle at the back (the jet unit thrusts out several tonnes of water per minute). We manoeuvre by moving the nozzle and directing the water flow; 'brakes' and reverse are achieved by reversing the water flow by lowering a deflector, similar to jet aircraft. The combination of powerful engine and jet enables us to move upstream, downstream or remain stationary in strong currents. Jets are able to turn on their own axis, even stop within a boat's length (creating our own waves). All this is achieved by directing water flow; we have no propellers to injure wildlife. Ocean Dynamics jet RIBs have made the national news and the international boating news. Bear Grylls achieved the first unassisted crossing of the north Atlantic Arctic Ocean with an Ocean Dynamics jet boat during his Arctic Challenge expedition. Greenpeace also operates three Ocean Dynamics jet boats. For details of what Ocean Raven (now Anaconda) is getting up to with Greenpeace, check out the Greenpeace website. The first Ribworker, Atlantic Eagle (now Brandaris II) is celebrating her 36th birthday this year, still working as a rescue and support vessel in the demanding waters of the North Sea. If you're interested in boats you'll enjoy the Ship Support Services Ribworker videos. The boat is fitted with a Yanmar 440 HP engine, which runs on marine diesel. The production of diesel is more environmentally friendly than that of petrol and diesel engines have a high level of fuel economy compared to petrol-driven marine outboards. The Yanmar 440 HP is fully compliant with international marine emissions regulations. The exhaust is silenced and under water, minimising noise pollution; the engine is soundproofed.